LGBTQ Open Enrollment Week of Action! 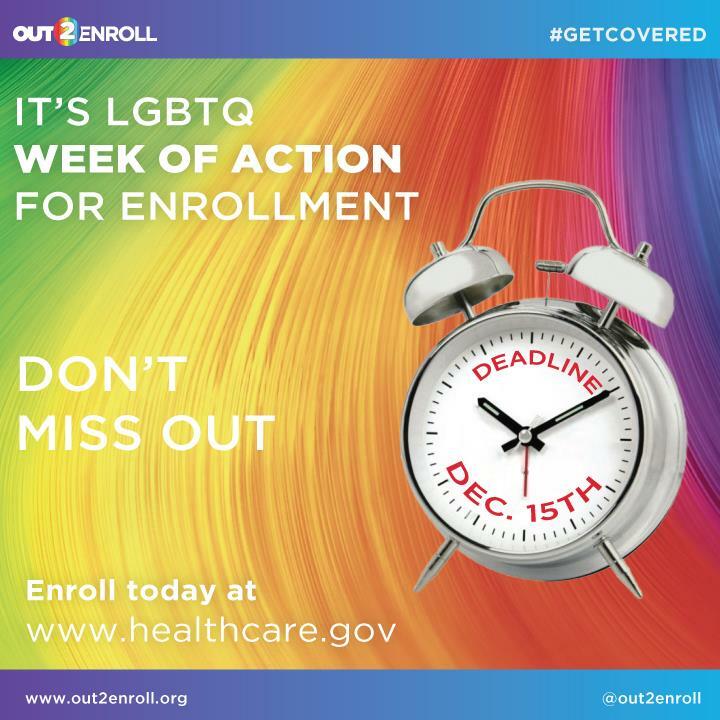 Today marks the beginning of LGBTQ Enrollment Week of Action for ACA open enrollment! This week, GLMA, along with other LGBTQ advocates and organizations, are encouraging our providers and members to spread the word about ACA open enrollment to the LGBTQ community! This year, funding for open enrollment education and outreach has been drastically cut, which means more work needs to be done to spread the word! GLMA urges our members and supporters to help us make sure the LGBTQ community knows that the marketplaces are still open, and health care plans are more affordable than consumers may think. In addition, GLMA will be sharing messaging on both Facebook and Twitter, encouraging our community to #GetCovered to share and retweet! Our friends at Out2Enroll have set up a Thunderclap for LGBTQ Week of Action, which allows you to connect your social media to release a scheduled message on December 5th. The goal is to simultaneously send the same message, calling LGBTQ people to #GetCovered, across many social media platforms to help extend reach to more folks. GLMA invites you to join in and add your support. Let’s take PRIDE in our health this year, and make sure that we ALL #GetCovered! Resources from Out2Enroll – Out2Enroll is the National Campaign to empower LGBTQ individuals and communities to get access to healthcare. Resources include finding free, local LGBTQ friendly enrollment assistance and extensive FAQ. NCTE Health Care Action Center – The National Center for Transgender Equality has up an action center, filled with information and resources specifically designed to assist transgender people navigate open enrollment. Health Plan Finder for PrEP – This is a navigation tool created by NASTAD that searches across plans offered through the marketplace and evaluates PrEP coverage to find the best plans available for PrEP.